Prepackaged salads are all the rage in grocery stores these days. Little plastic bags packed with shreds of lettuce, cabbage, carrots, and other assorted greens. These instant salads are definitely convenient, but are they worth the price, considering how easy it is to grow your own fresh salad greens (that probably taste a lot better) right at your back door? 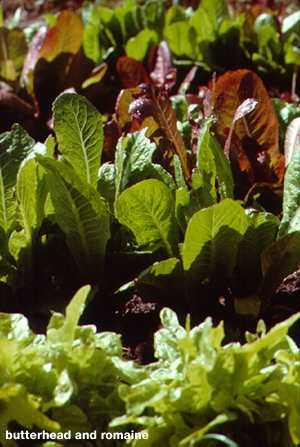 Lettuce: There are four main types of lettuce: looseleaf, butterhead, romaine, and crisphead. All four can be started directly in the garden in the early spring, but you may get better results (and eliminate tedious thinning chores) by starting them indoors 4 to 6 weeks before planting time in your area. For small space salad gardens we recommend looseleaf such as ‘Red Sails,'. You can plant looseleaf varieties very close together and harvest them over and over again by trimming the leaves you need. When you grow other types of lettuce you must harvest the entire plant which will leave a gap in your planting plan. Spinach: Like other salad crops, spinach prefers to grow and develop while the weather is still cool and moist. 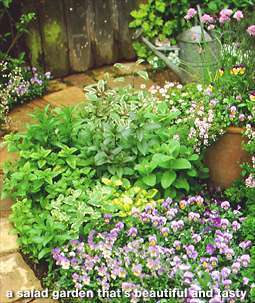 In the early spring, sow the seeds directly in the garden and thin the young plants to stand three or four inches apart. Chives: Once planted, this perennial member of the onion family, produces masses of fresh greens you can harvest from early spring till late fall. Plus, the flowers are edible. Plant chives in a corner of the garden where they won’t be disturbed when you do spring soil preparation. For a variety of flavor, include both fine-leaved chives and garlic chives in your garden. Cabbage, Broccoli, Cauliflower, Brussels sprouts: These four cousins are easy to grow if you remember a few important tips. First, start them indoors under grow lights about 6 to 8 weeks before planting time in your area. This headstart will help them reach maturity before hot weather sets in. Also, protect your plants from hungry cabbage looper caterpillars by covering the seedlings with row covers. This will prevent the adults (white cabbage butterflies) from laying their eggs on your plants. If you don’t use row covers, spray the plants at weekly intervals with Bacillus thuringiensis, a naturally occuring, biologically safe, method of caterpillar control. And finally, remember that cauliflower and Brussels sprouts often do better as fall crops. Start them in midsummer so they mature during the autumn. Frost often improves their flavor. Carrots: Probably the "hardest" salad crop for many gardeners to grow are carrots. In the garden, the seeds can be slow to germinate and, because they look so much like grass, they can be difficult to thin. Sow a handful of carrot seeds in a 4-inch plastic pots and starts them under grow lights (do this with a dozen or two plastic pots). When all the carrots are up and growing, transplant each pot of carrot seedlings directly into the garden as whole units, spacing the clumps about 12 inches apart. The carrots don’t seem to mind being crowded into their small units and there’s plenty of growing room between each clump for weeding and cultivation. Then, at harvest time, pull an entire clump out of the ground at one time. Some of our favorite varieties include: crispy French ‘Bolero Nantes’. Swiss chard: Swiss chard is one of the best kept secrets in the salad garden. These beautiful plants, which are actually members of the beet family, grow quickly from seed and look as home in the flower border as they do in the vegetable garden. Plus, they’re very heat tolerant so you can harvest Swiss chard throughout the summer, long after lettuce and other greens have disappeared. Good varieties include: ‘Bright Lights,’ and ‘Flavesens’. Parsley: When you’re planning your salad garden don’t overlook this flavorful little herb. Available in both flat-leaved and curly-leaved varieties, parsley can be so much more than a wilted garnish at the side of an entree. You can use parsley in salads, soups, stews, and even pesto. Both types of parsley germinate slowly so you may want to start with young seedlings. The flat-leaved types generally have more flavor than the curly-leaved types, but they are not very heat tolerant so it’s best to grow both parsleys to insure an all-summer harvest.